What causes this apparent image off-centering on the sensor? In fact you actually see the screen shot of the Realviz Stitcher 5.6 Lens Circle Calibration windows. No adjustment is yet done here: the red circle A was auto-determined by the software and best estimated by the internal engine. An other circle B with a blue outline can be barely guessed inside the larger A circle. 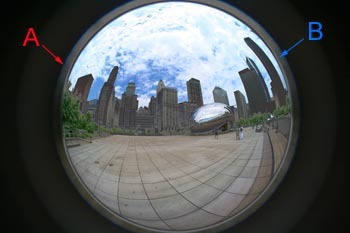 This blue outline is typical of the peripheral area of a fisheye and I am convinced that it is here also the case: The actual circular fisheye image is restricted into this smaller circle B and one should conclude that it is largely off-centered. With this assumption in my mind, I have then proceeded into stitching this above hemi-spherical image with its "twin" hemi-spherical image that was shot in the direct opposite direction. In PTGui Pro 7.3, I have inputed the whole set of 4 images that I have been supplied with by John Law: these four images where shot about 90 degree apart from each other in yaw. 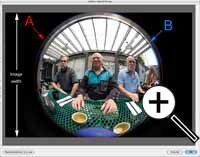 This process allows a good calibration of the lens as the overlap between two consecutive images is wide enough. It would have been impossible to have confidence in the calibration got from only two opposite hemispherical images. I have cropped the 4 images as described above (circle B) and proceeded with the optimization and PTGui Optimizer (or PTOptimizer) has given the optimized parameters and coefficients for this lens. Q: Why are there two circles A and B in the image? R: Circle A is most probably due to the very unusually large and quite flat front surface of the cylindrical structure surrounding the forward optical group of the lens. Despite the grooves and black coating, it reflects on half a circle the peripheral light (i.e. outside the usable 185°). Q: Why is the usefull image circle B off-centered? R: I do not think of another reason than bad centering or misalignment of the optical groups of elements. After all this was a Lens Prototype, wasn't it? Another possibility would be much more alarming though: this crescent shaped area that is the substraction circle A- circle B may well come from lens internal flare. If this was the case, then the real FOV -when the light of the scene doesn't bother the lens- would be higher. I have checked with PTGui that the circle A would yield a FOV~ 206 degrees (i.e. on par with the Nikkor 10.5 mm). Does this make sens? Remarks: This image was actually shot about one month after the other four preceding images and with the very same camera. These facts are recorded on the EXIF information of the JPEG and CRW respective photographs. Beware: Due to high compression and heavy sharpening, this JPG image is of a terribly poor quality. 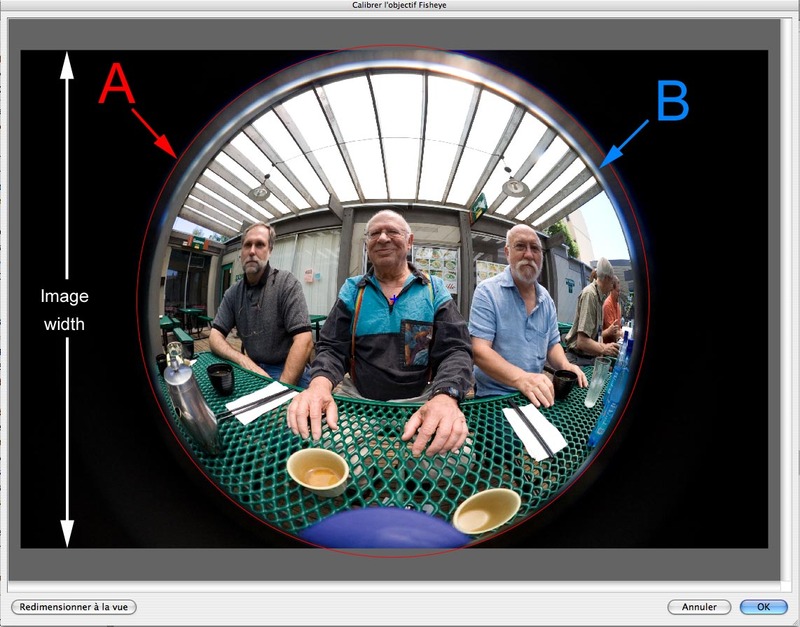 It probably doesn't favor the optical ability of the fisheye lens. There is no "2 circles" in this JPEG image above but there is just a single one. The single circle seems to encompass exactly the usefull fisheye image. The circle is just and perfectly centered in the width of the image and no cropping affects the circle (it does on both sides on the larger A circle of the preceeding images). The size of the rectangular JPEG image is identical to the previous four RAW images 3456 x 2304pixels. It was therefore not cropped to make the circle tangent to the side. There are also (at least) two circles but the outer one A is much faintier than before. The inner circle B (i.e. the usefull image) is now centered all right and is exactly tangent to the long sides of the rectangular image. Then it is obviously bigger than it was on the first four shots! While I can understand that improvement could have been done on the prototype lens to better center the circle inside the sensor rectangle, I see no reason that would increase the diameter of the useful image in such a proportion besides a design change. The other possibility that I have mentionned (Internal strong flare) cannot be supported with the presently available material... If it was the case, I hope this has been corrected in the final production model. Not having a sure answer to this question. I wonder if it is wise to review the optical quality of the lens before having images shot with a real production model for test.